A new short film written and performed by Kim Ho tells the story of a 17-year-old gay teen who struggles to find the words to be true to himself… and his best friend — a story that captures the feelings and emotions of gay kids who often feel alone and isolated because of their sexual orientation. Ho was one of the winners of the 2012 monologue competition, Love Bytes, held by Fresh Ink, a development program for emerging playwrights from the Australian Theatre for Young People. 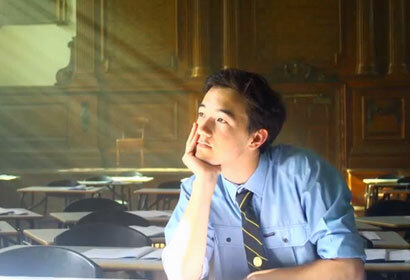 Under the mentorship of leading Australian playwright Tommy Murphy, Ho transformed his 3-minute video entry, Transcendence, into this short film. His film, “The Language of Love” is a wry, delicate take on first love and awakening sexuality from a young man’s perspective. To watch “The Making of ‘he Language of Love'” or Ho’s original entry, “Transcendence,” click here.